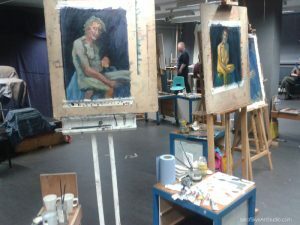 After four days’ life painting in Edinburgh in a workshop by Alan McGowan I found myself repeating “build a bridge between the orange and the blue, build a bridge between the orange and the blue“. 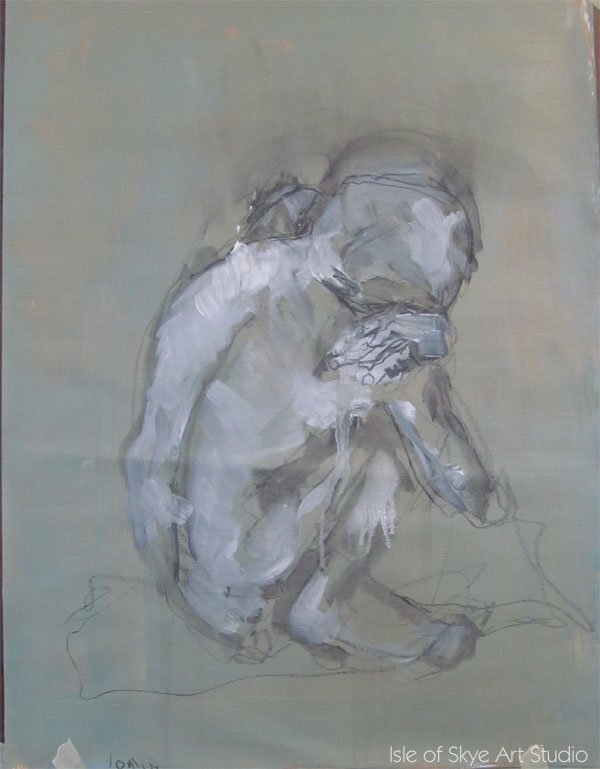 Or more fully, create a colour link across the figure between the orange-warms bits and blue-colds parts through desaturated mixes of these. 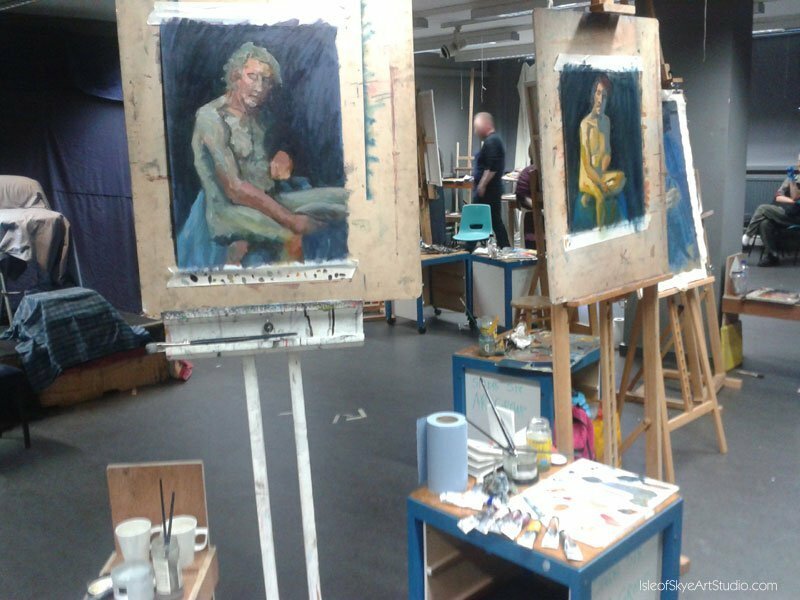 It had been a rewarding follow-up to last November’s Life Drawing into Painting Workshop. As always on a workshop, I learnt a lot and met interesting people who I wish I’d talked to more (my head is often so full during a workshop I find it hard to chat). My thanks to Alan, who is a generous, patient, encouraging, and understanding tutor. Thanks also to models Topaz, Nicky, and Alistair. I feel I’ve made progress mixing “interesting greys”, and (finally!) 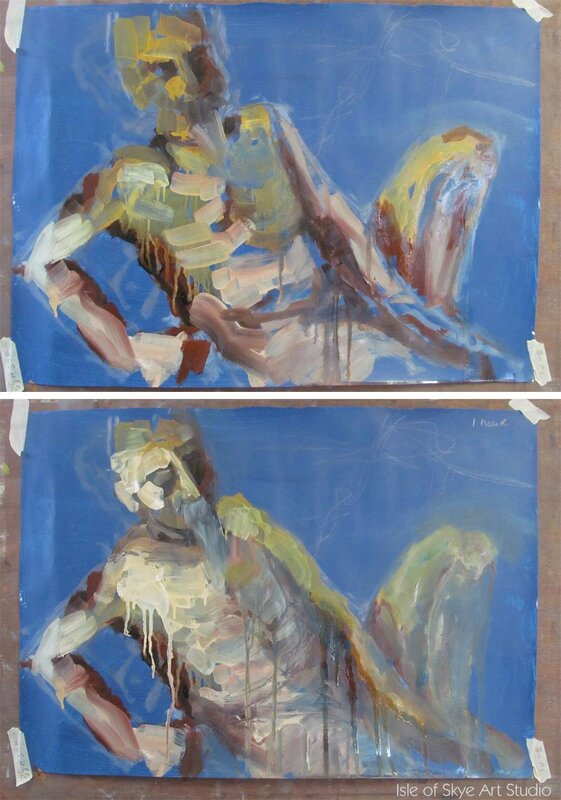 created a figure painting where I didn’t inadvertently put a “warm” mixed colour onto a “cool” part of the figure (and vice versa). Saturation as purity rather than intensity of a colour. Create light by darkening other areas; dim the lights elsewhere. Strongly found vs lost edges. Don’t start dark and definite. Work from the middle outwards. Avoid using white in shadow colour mixes. Don’t block in with white (or mix with white) early on. Relate shadow to shadow to judge the tone, not shadow to light (e.g. shadow beneath arm to shadow beneath chin not to light on top of arm). 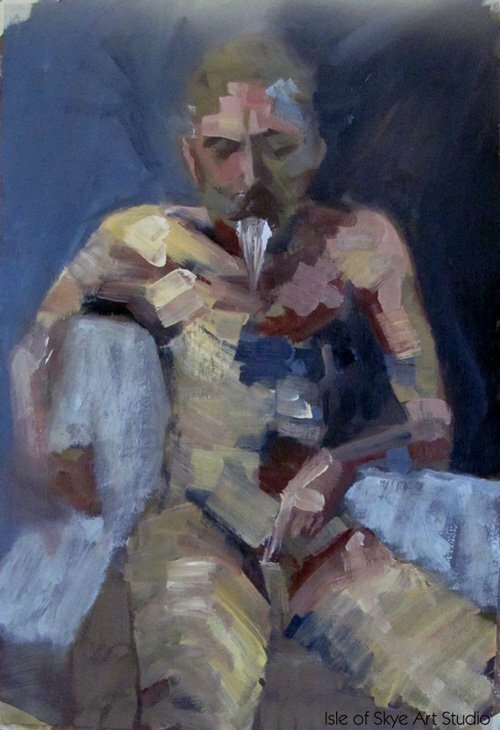 Don’t paint reflective light as bright as direct light; if it’s equally bright it’ll flatten the figure. A small colour shift has great impact amidst desaturated colours. Add white to a background colour to make it opaque; it’ll demand less attention than transparent colour. The face colours on Whistler’s Mother are cold; it’s the rest of the painting’s greys that make it seem warm. 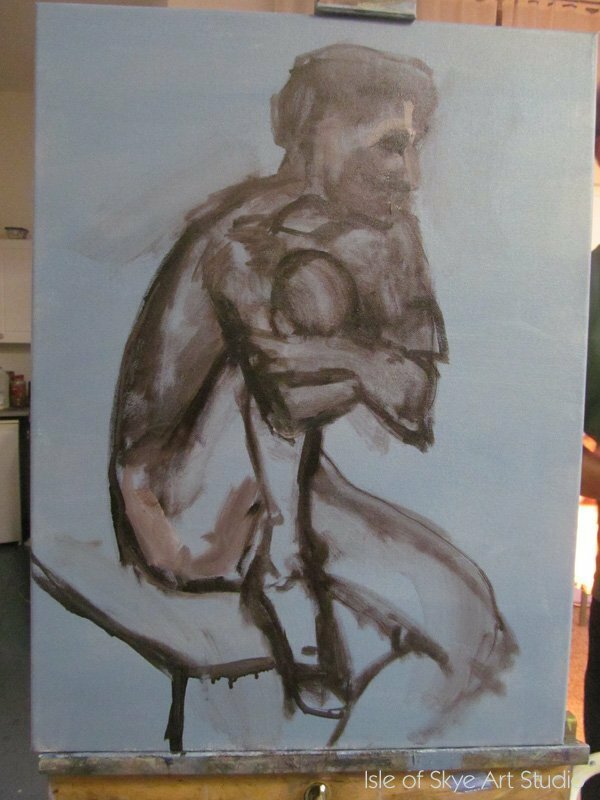 Used caput mortem (very opaque oxide violet red) for drawing into a work in progress; sits strongly on top of wet oils paint. Isolate it on palette so don’t accidentally include it in other mixes. 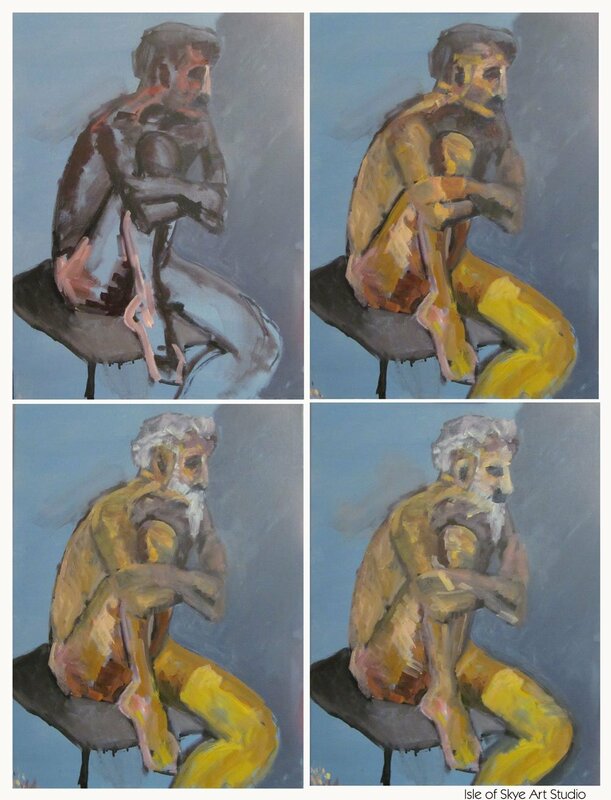 Colours I used: Prussian blue, cerulean blue, Payne’s grey (Sennelier’s, which is very blue), vermillion, alizarin crimson, magenta, primary yellow, yellow ochre, burnt umber, raw and burnt sienna, titanium and zinc white. 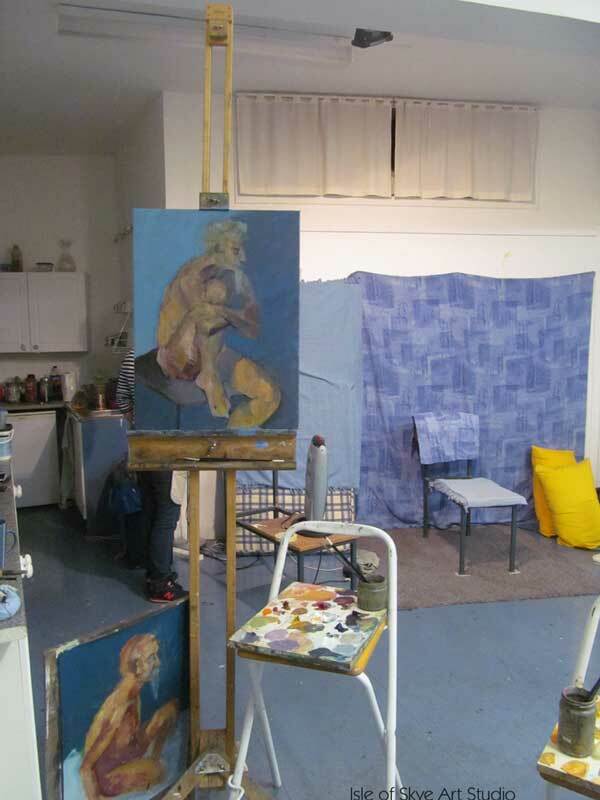 On Alan’s workshop colour list that I didn’t use: ultramarine, viridian. *Written in a pocket sketchbook during the workshop, because I know I’ll forget too much otherwise. 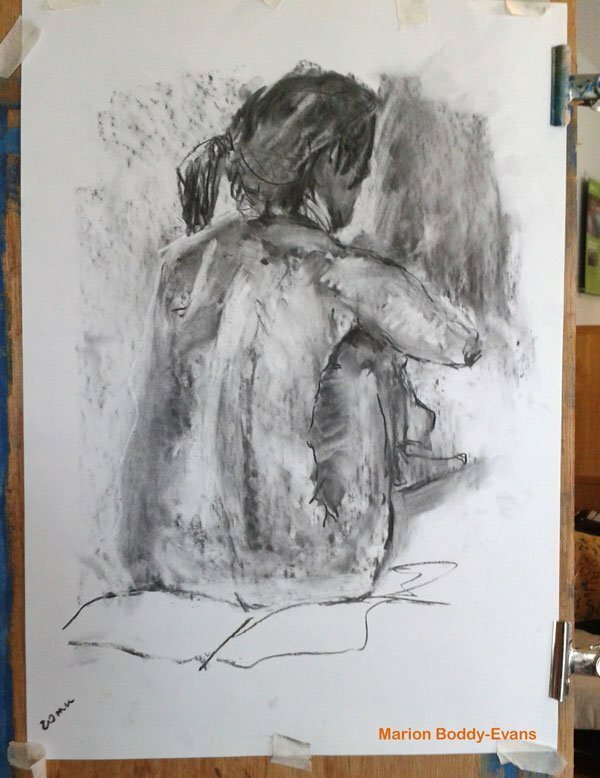 I’m away for the weekend for a little creative R&R, on a life drawing/painting workshop being led by Alan McGowan for Art Lochaber. 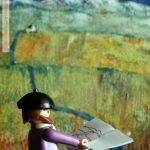 Besides the creative stimulation (and break from the varnishing, stringing and admin for my forthcoming exhibition), I was hoping to build on what I’d done last November. I printed out my notes to myself from that workshop, and did today find myself mentally referring to some points (e.g. 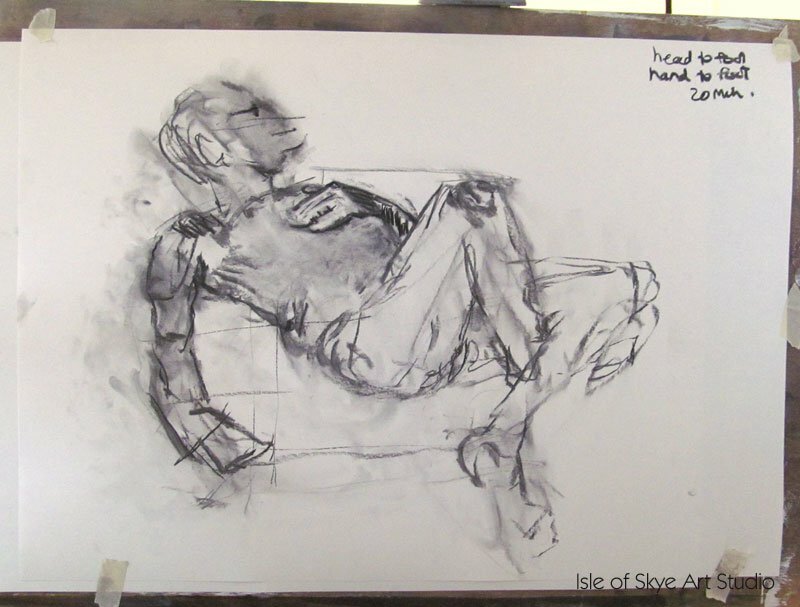 positioning the angle of the head by looking at where the mouth was in relation to a mental line drawing across the shoulders). 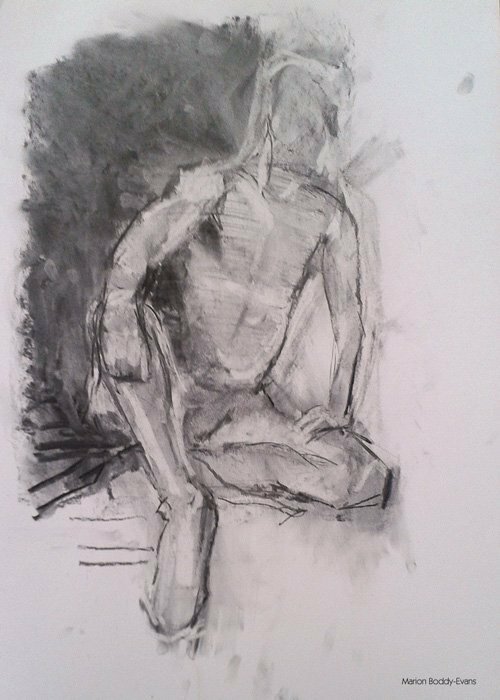 I’m pleased with what I produced, especially the tonal ‘lift-off-the-paint’ Rembrandty one, but as for being less heavy handed with charcoal, well that’s still on my to-be-improved list. Apologies, the photos are mere phone snaps. 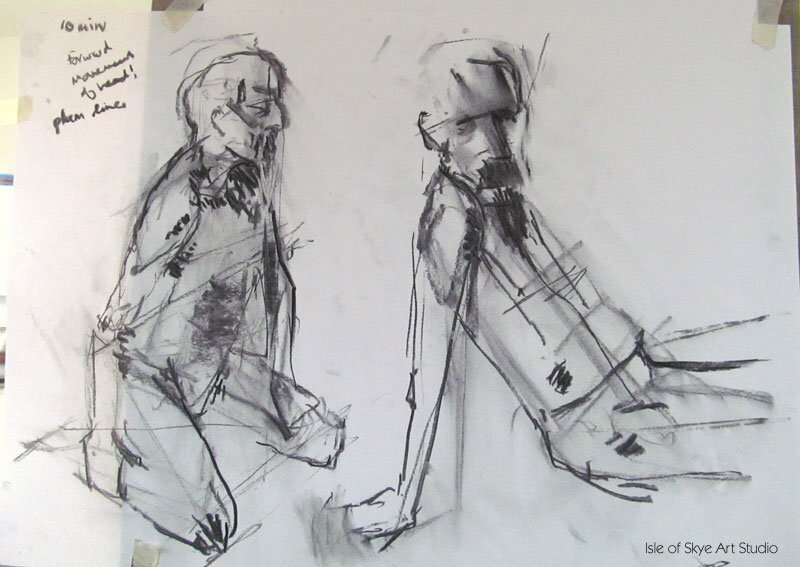 Three gesture drawings; three minute poses. 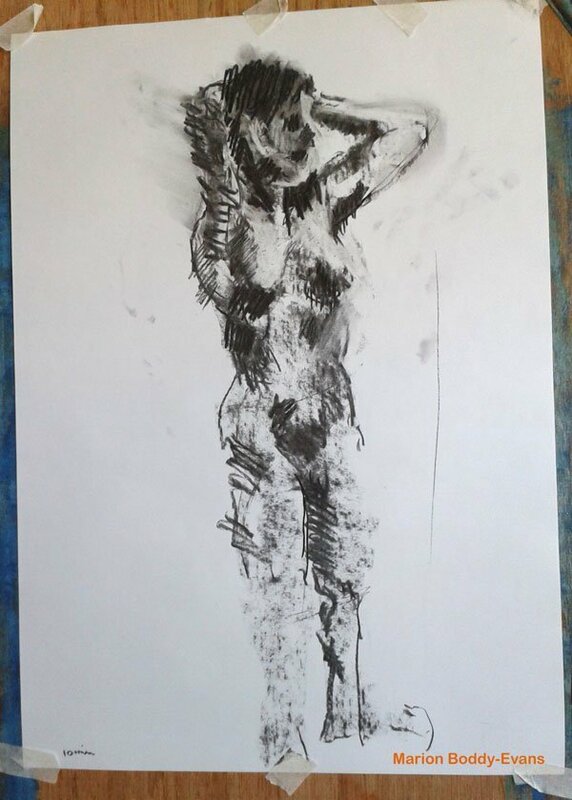 Charcoal on A2. 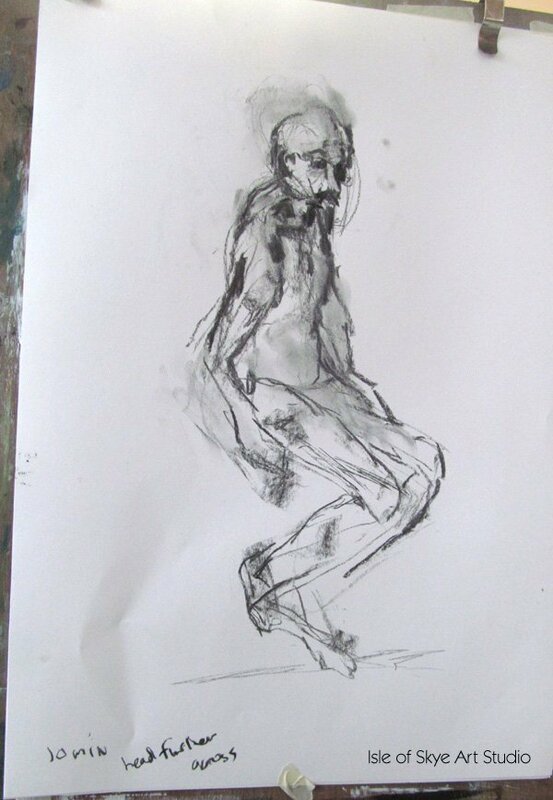 Five minute pose. Charcoal on A2. 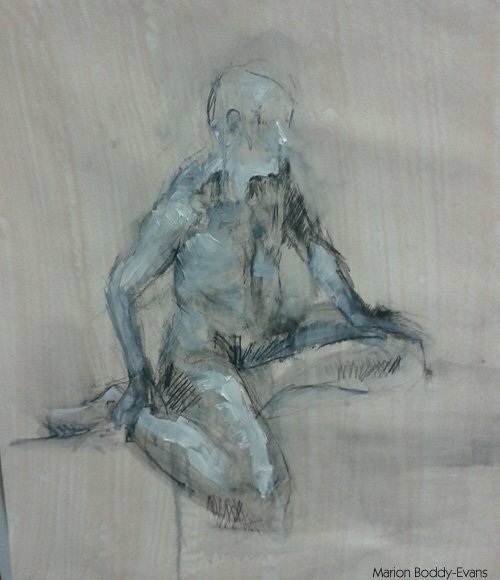 10 minute pose. Charcoal on A2. 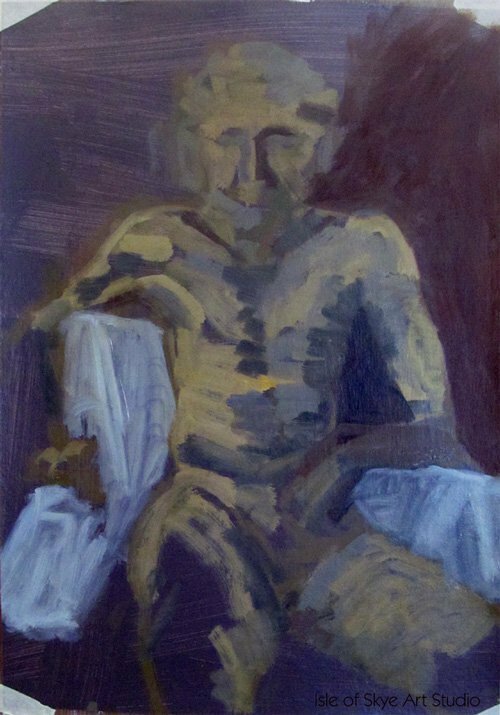 20 minute pose. Charcoal on A2. 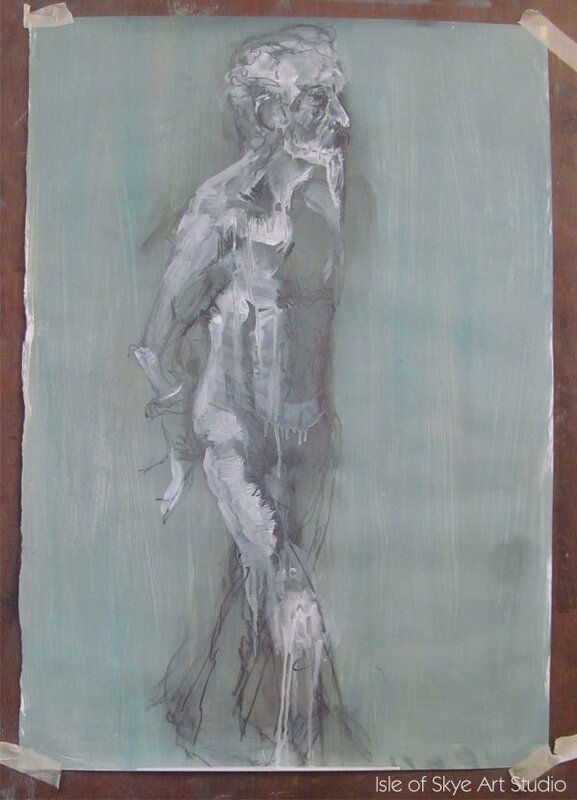 Graphite and solvent on acrylic primed paper, plus white oil paint. A2. Working from dark to light. 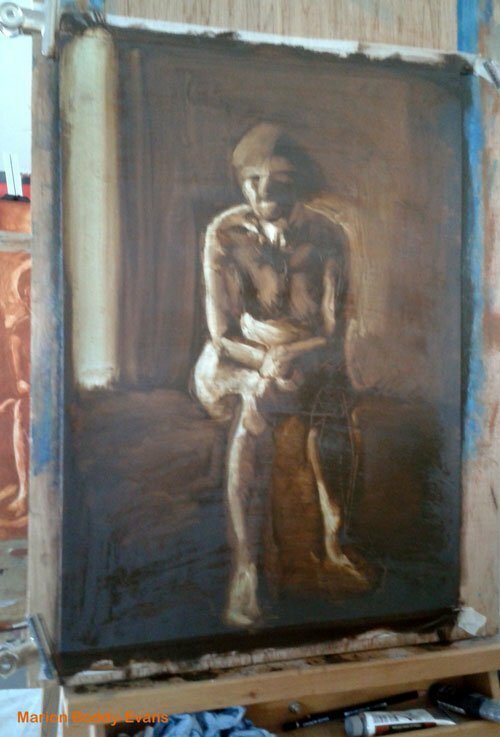 Mixture of burnt sienna and Prussian blue (both transparent pigments) mixed with a little linseed oil to slow drying, on primed paper. Wipeaway with cloth and brush/solvent to get highlights. 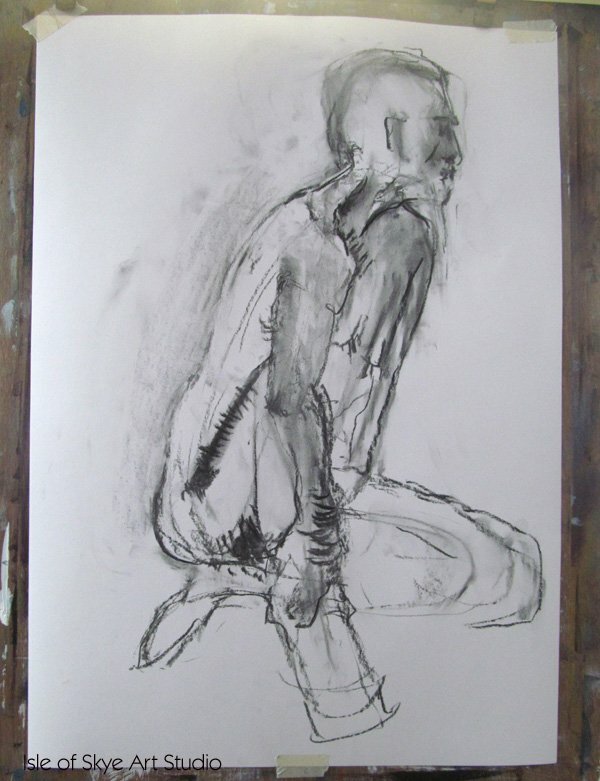 Second day of Alan McGowan?s ?Life Drawing into Life Painting? 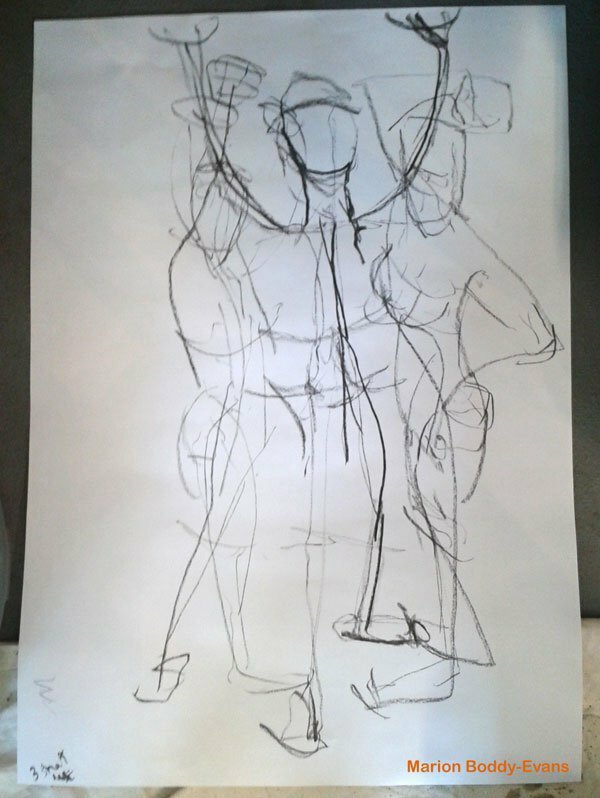 workshop saw us start with three charcoal drawings, both as warm-ups and to increase the number of drawings we do overall during the week. This suffers from “head sits above shoulders” problem — straightening the neck and putting the head too high. You can see Alan’s light charcoal marks where he’s shown where it more likely is. 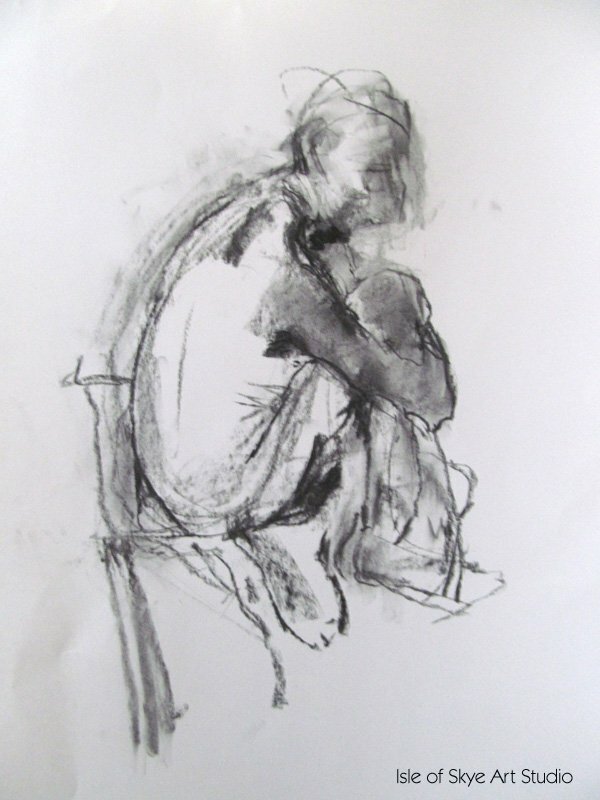 A lot unresolved, but I like the mood of this drawing. I do wonder if it’s because it’s dominated by line, rather than tone. 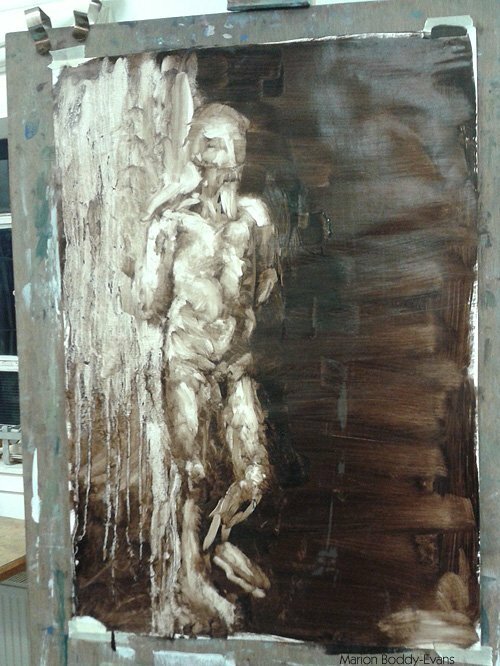 Next up, tonal painting with acrylics. My attempt went from “dubious but with a sense of light” to “decidedly dubious and now also dull” (my words, not the tutor’s!). I put this attempt into the “trying too hard” category, where I get so desperate for things not go wrong further that of course things do. 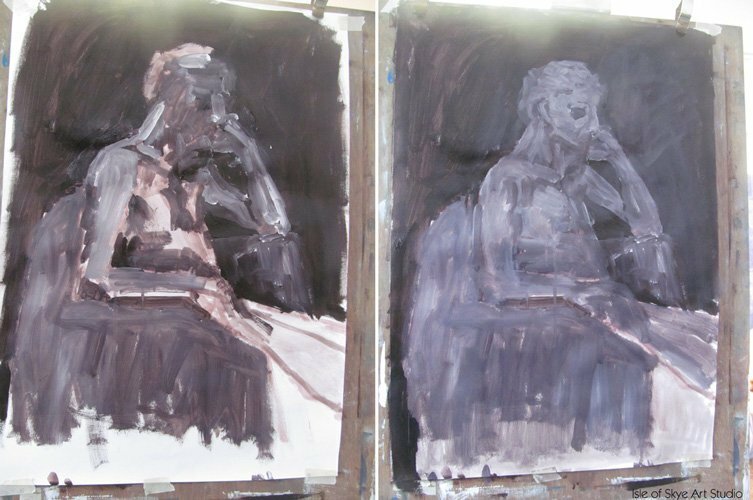 So much for introducing light into my tonal study. 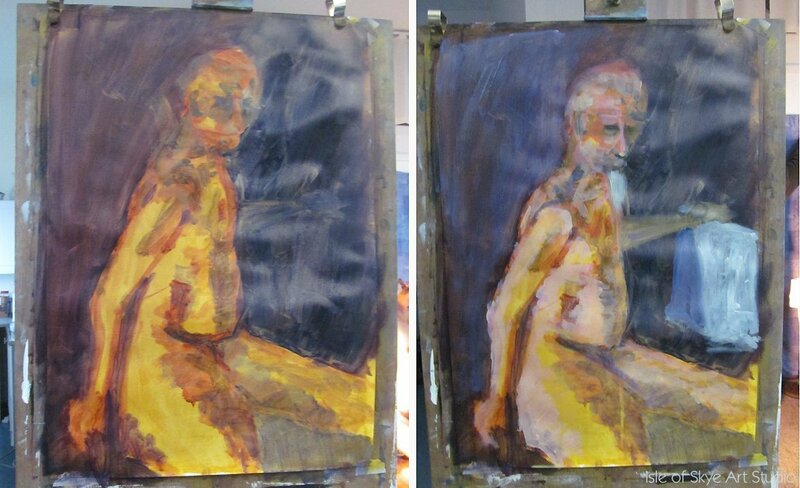 The left-hand photo is where it was when the model took a break; the right where it ended up. Then onto a colour acrylic painting. 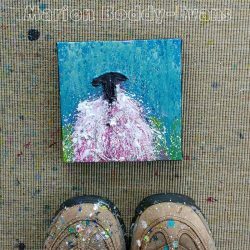 Colour…I can do colour, can’t I…?! 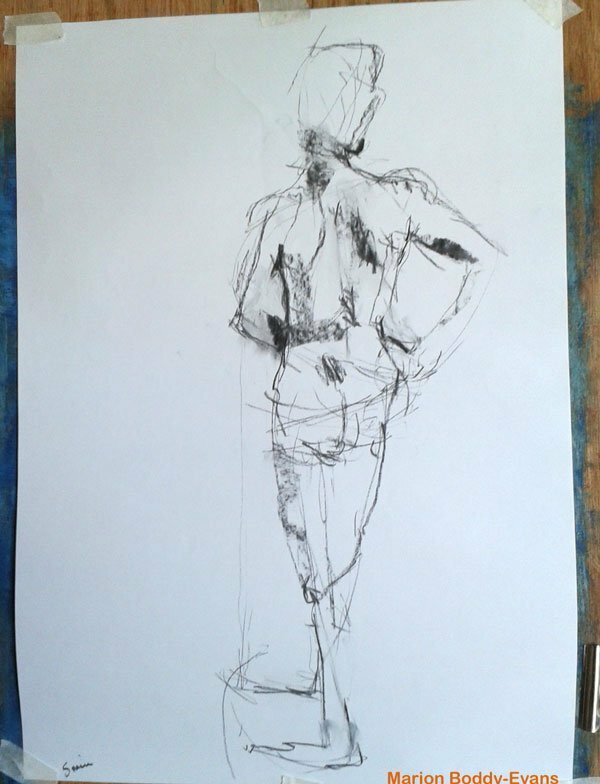 Yes, but can I do composition, proportions, tone, considered mark making, warm and cool, colour and a living, breathing model…? Oodles?wrong unresolved in this, and model’s beard definitely too blue, but a few aspects I like. 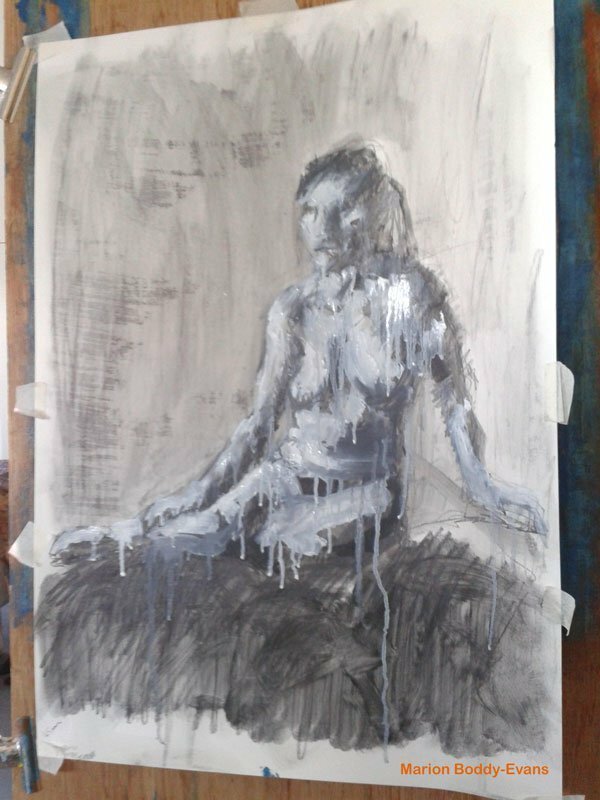 And finally the initial drawing in acrylics for an oil painting to be done over the next three afternoons. 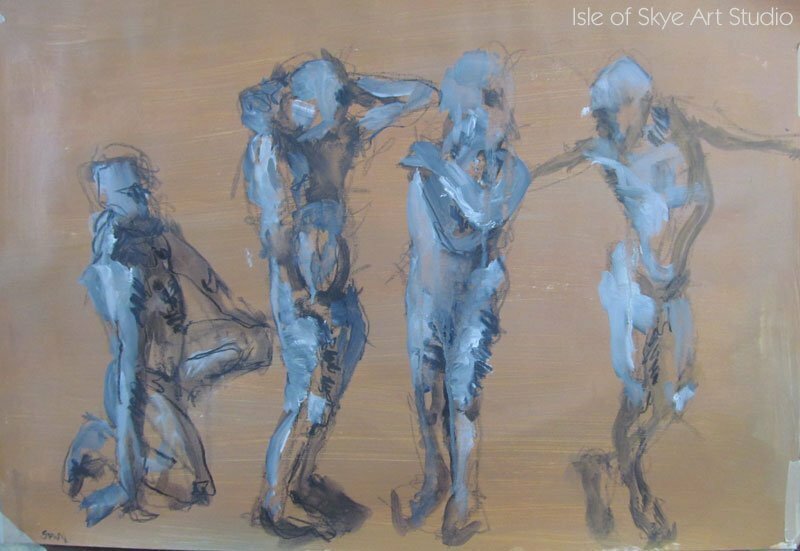 Idea is that if you end up in a murky oil-paint mess, you can scrape back to this acrylic start. The more I look at this photo, the more I see how his legs/arms need adjusting. Remember head and neck sit within the bowl of the shoulders, it’s not a lollipop stuck on top. Check position and check again! Think of dotted line joining the two shoulders, and what facial feature this goes through. For instance, bottom of chin or nose, or the mouth. Check relationship to spine and vertical relationships (with pelvis/feet) to check position. 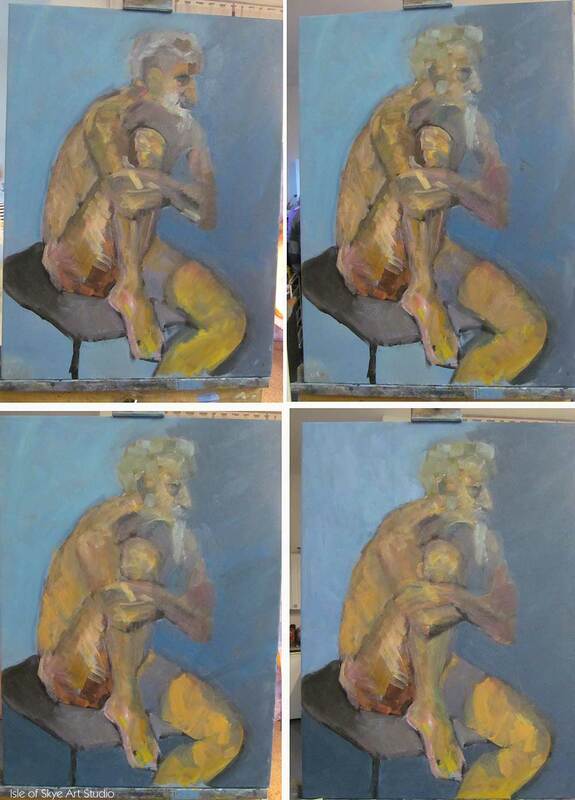 Follow the progression: composition, gesture (armature), add the destinations (head, feet, elbows/hands) in probable positions, find the road between the destinations (focus on mass not outline), cross-check the map (check relations between body parts), adjust and repeat, and only when this is sound start looking at tone. Add eyes, nose, and planes around eyes early on for a sense of scale overall. Be deliberate, decisive, find and loose edges with considered looking. Four considerations not two, especially with orange light on model from heater: warm highlights, warm shadows, cool highlights, cool shadows. Most of the painting will be midtone. Eliminate the unwanted light of the paper fairly early one, all the way to the edges; it distracts the eye. 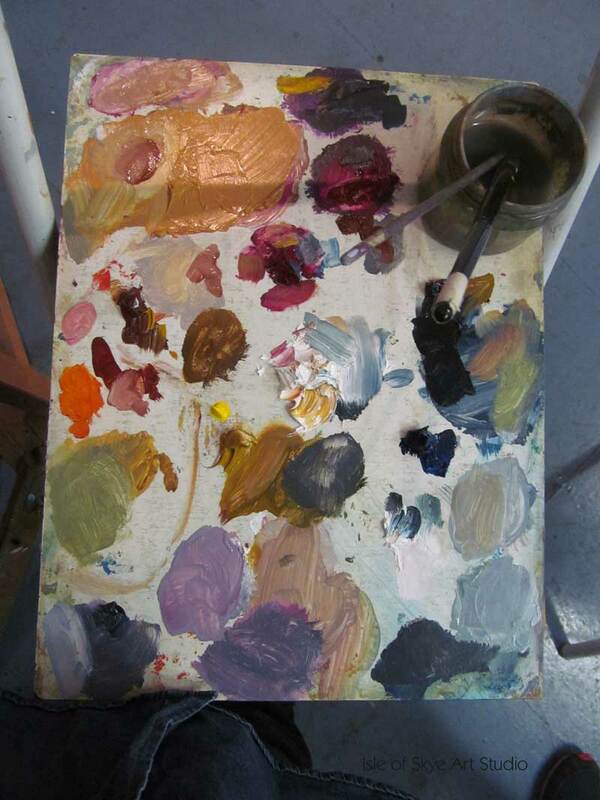 Traditionally a dark background would be done with glazed layers not thick paint, which is reserved for light tones. Turner’s known for his landscapes, not his figures. 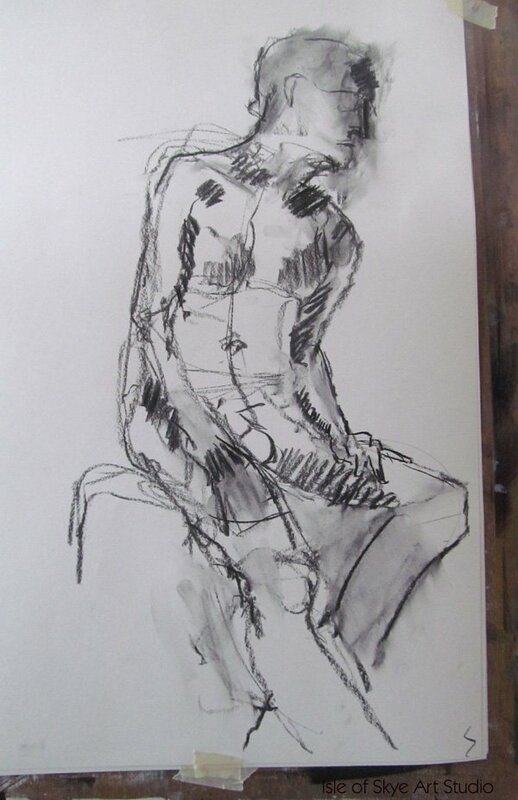 Part of the on-going demo drawing Alan McGowan creates during his workshop.